Last sunday, Belgians went to the polls in order to vote for regional, federal and European elections. During this sunday afternoon, the evolution of the trends and poll results were broadcasted on RTBF. The shooting of the gestural translation was broadcasted live from KeyWall’s studio and DreamWall contributed to the rest of the project. Indeed, our team made the graphical chart with logos, TV branding, 3D results rendering… Our strength on this project was the augmented reality that came on top of the real set and the creation of graphical scene for the results. This technique, fully mastered by DreamWall, improves the final rendering in comparaison to the other TV Channels. 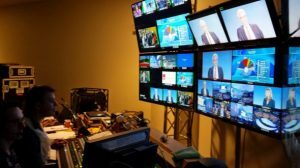 In the same period of time, DreamWall also took care of the presentation of the official results of the European elections broadcasted in real time 3D accross 120 countries.